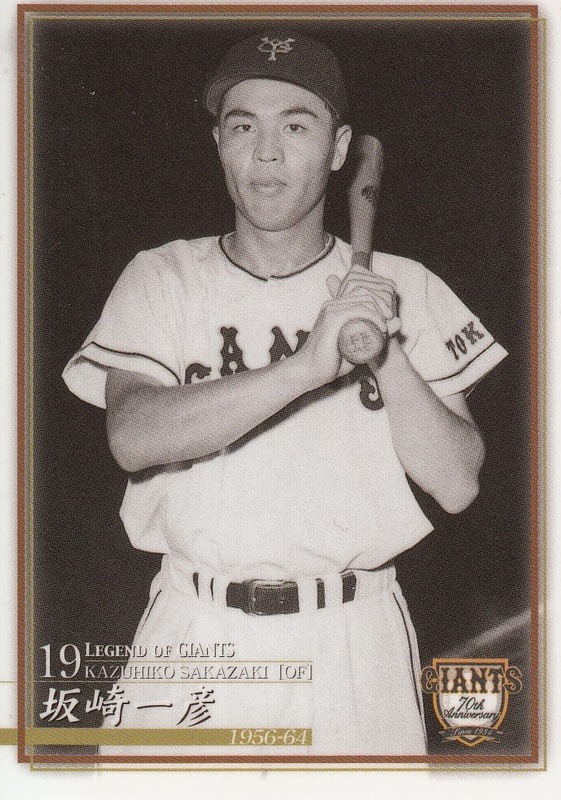 Former Giants and Flyers outfielder Kazuhiko Sakazaki passed away earlier this week. Sazazaki strikes me as someone who had unfortunate timing. 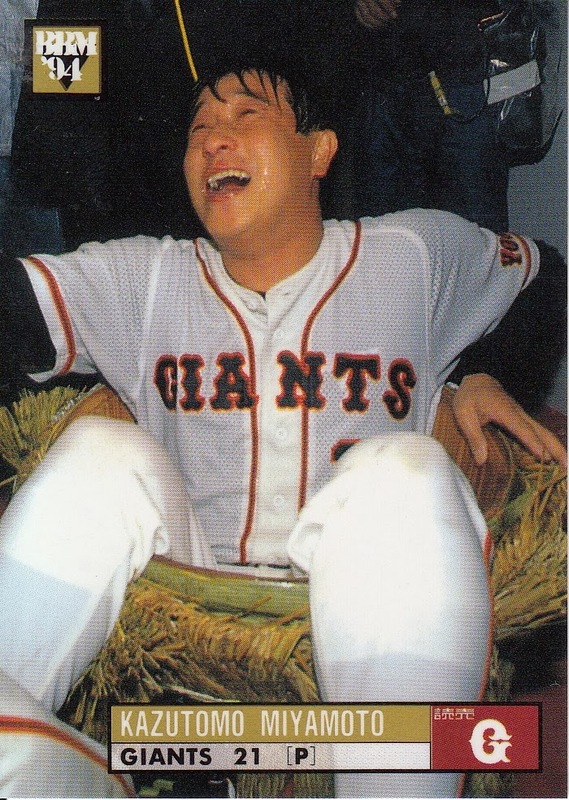 He joined the Giants out of high school in 1956, just after the Giants had won four of the previous five Nippon Series. 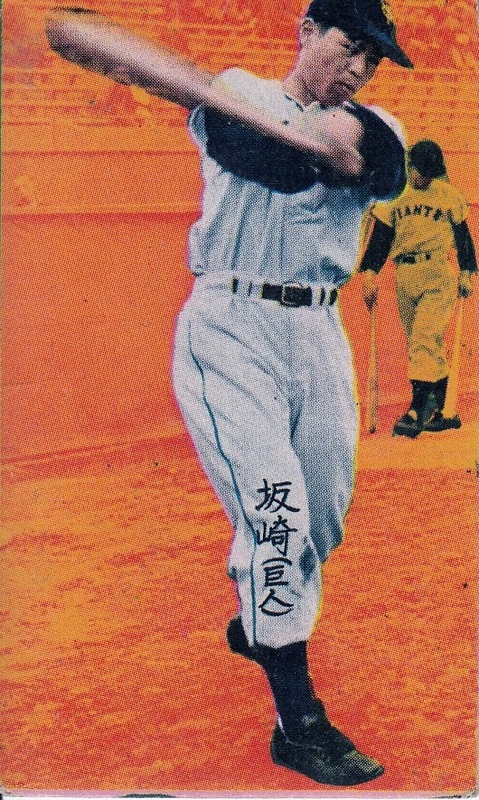 He left the Giants for the Toei Flyers just before the 1965 season, the year the Giants embarked on their streak of nine consecutive Nippon Series championships. He did win championships with the Giants in 1961 and 1963, however, so he didn't completely miss out. He retired following the 1967 season. 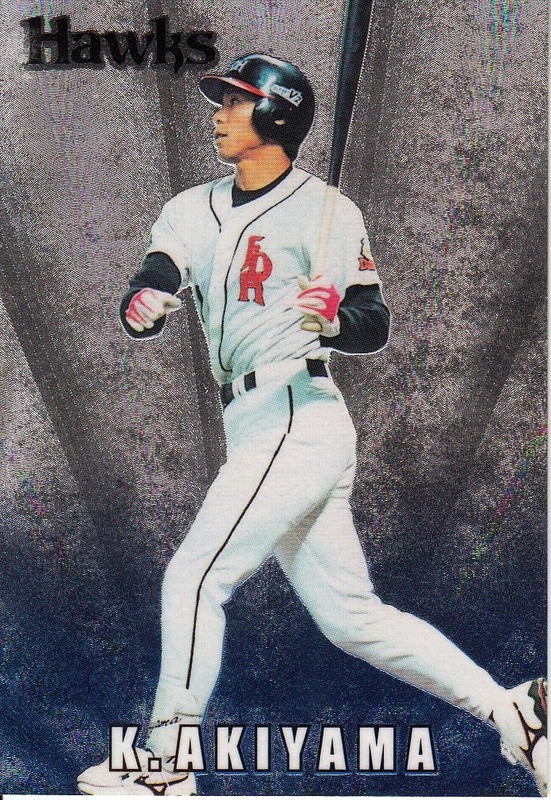 I believe the only modern card of Sakazaki is from the 2004 BBM Giants 70th Anniversary set. He had a number of menko and game cards during his playing career. This 1950s poster advertised a game in the Japanese major leagues' Pacific Division. The game was played between the teams of Nishitetsu and Mainichi at Heiwadai Stadium outside of Tokyo. The history of baseball in Japan dates back to the 19th century, as does America's baseball tradition. - It's "Pacific League" not "Pacific Division"
- I think it's actually advertising two games between the teams, on March 30 and 31. - Heiwadai Stadium was indeed outside of Tokyo. 350 miles outside of Tokyo. The ballpark was in Fukuoka, which isn't even on the same island as Tokyo. - The Lions wore those uniforms between 1954 and 1959. The Mainichi Orions existed from 1950 through 1957 (after which they merged with Daiei Unions to become the Daimai Orions). So the poster is from between 1954 and 1957. 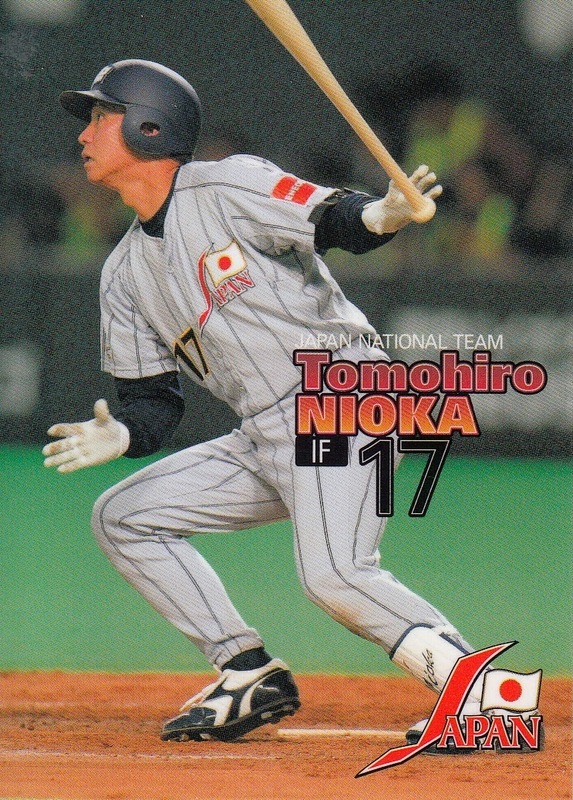 It's been about 10 days since the announcement but I'm just now getting around to writing about it: Tomohiro Nioka of the Hokkaido Nippon Ham Fighters has decided to retire. 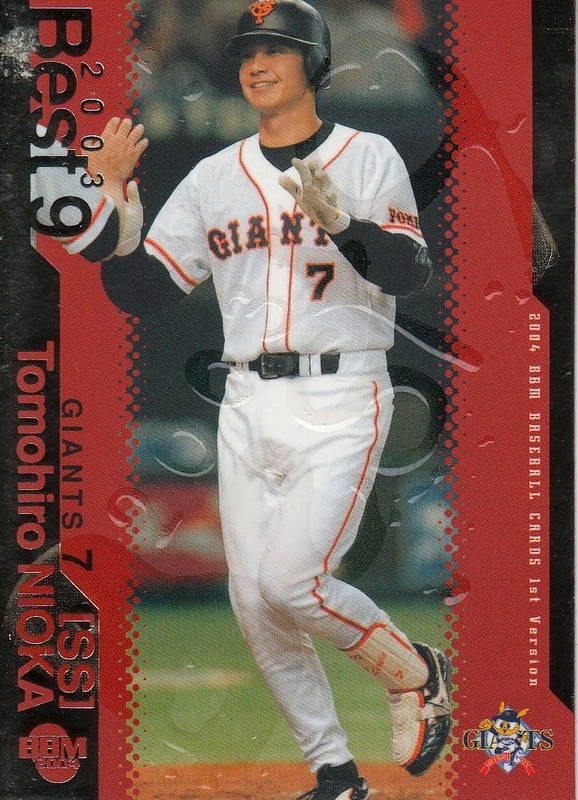 Tomohiro Nioka was taken in the second round of the 1999 draft (held in the fall of 1998) by the Giants (their first round pick that year was Koji Uehara). 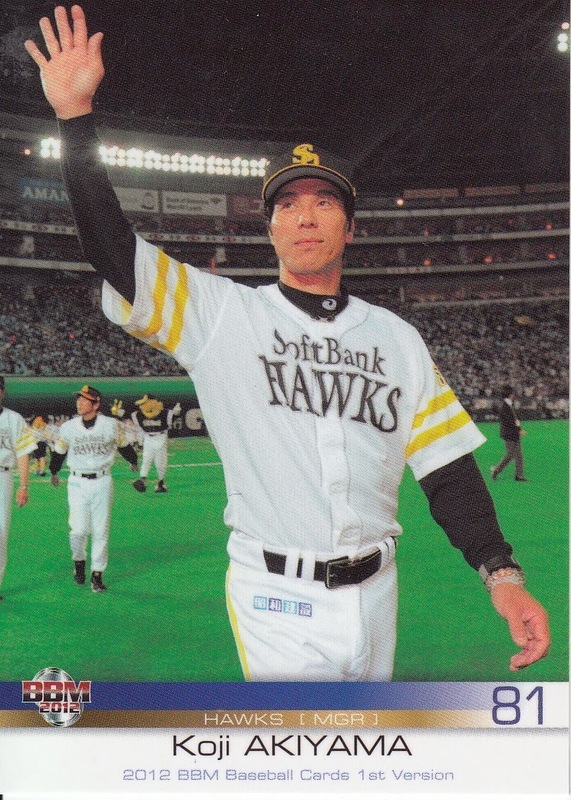 He was immediately installed as starting shortstop in 1999 and would remain there until giving way to Hayato Sakamoto in 2008. 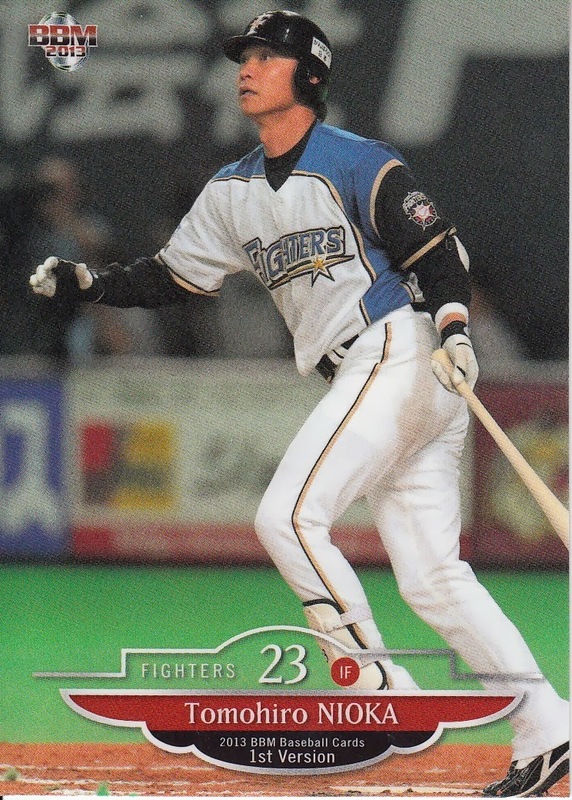 Nioka's rookie cards were #330 in the 1999 BBM set and #087 in the 1999 Calbee set. 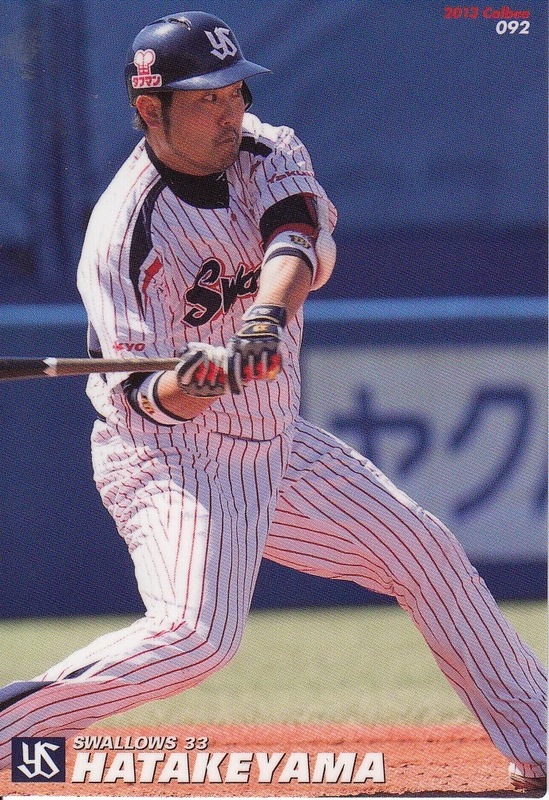 Nioka remained with the Giants until the end of 2008. 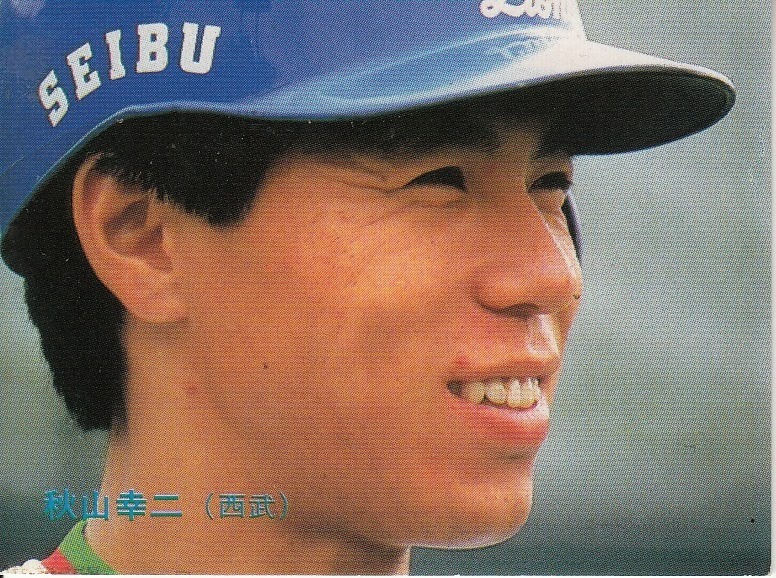 He had a number of productive years but was only able to win one Best 9 award (it was difficult to dislodge either Takuo Ishii or Hirokazu Ibata from that award). 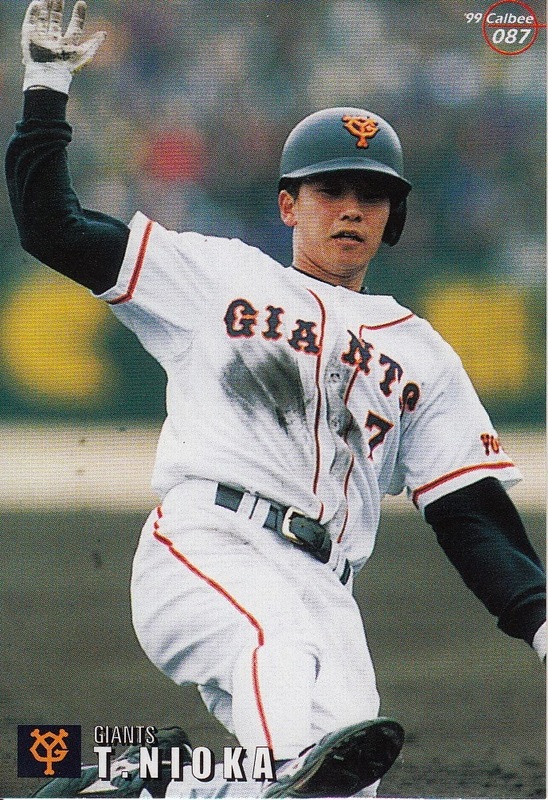 After a 2008 season that saw him have drastically reduced playing time due to Hayato Sakamoto and Michihiro Ogasawara having much better seasons, an ankle injury and a scandal in his personal life (he was caught cheating on his wife), the Giants traded him to the Fighters in a deal that brought Michael Nakamura to the Giants. 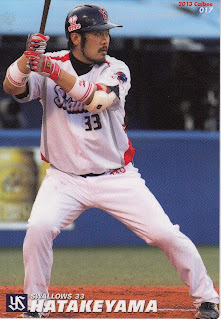 He rebounded somewhat his first two years with Nippon Ham only played a little over a full season's worth of games at the ichi-gun level his last three years. 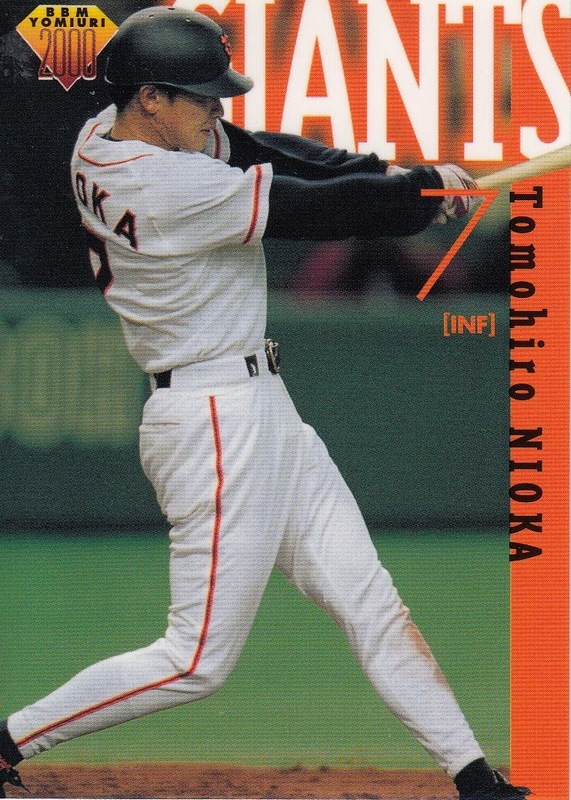 Over the course of his career, Nioka made the All Star team seven times - 1999, 2000, 2003, 2004 and 2006 with the Giants and 2009 and 2010 with the Fighters. 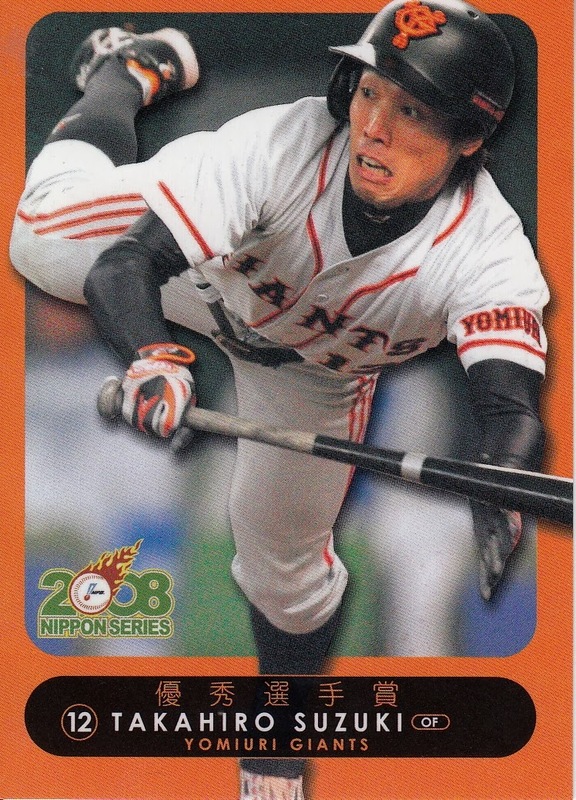 He appeared in four Nippon Series - winning with the Giants in 2000 and 2002 (in which he was Series MVP) and losing with Fighters in 2009 and 2012 (against his old team both times). He also played for the Japan National Team in the 2003 Asia Championship, the qualifier for the 2004 Olympics. This year's Hall Of Fame inductees were announced today. 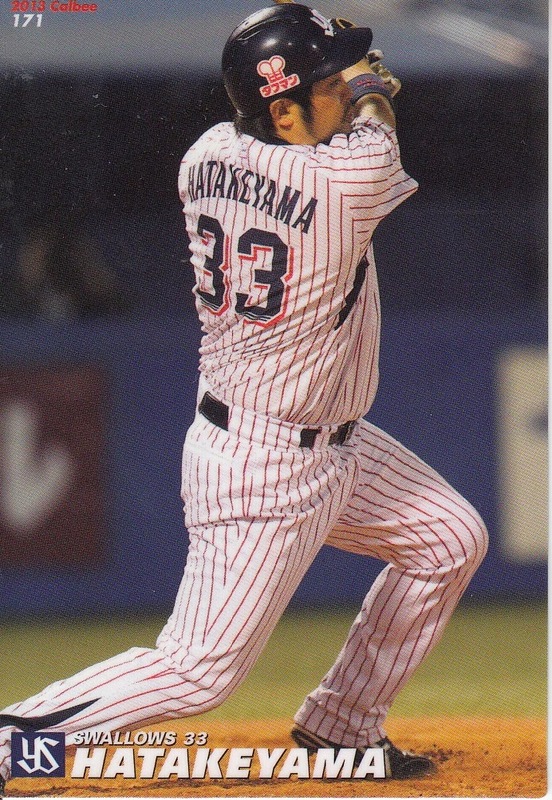 There were three players elected from the Players Division - Koji Akiyama, Hideo Nomo and Kazuhiro Sasaki. 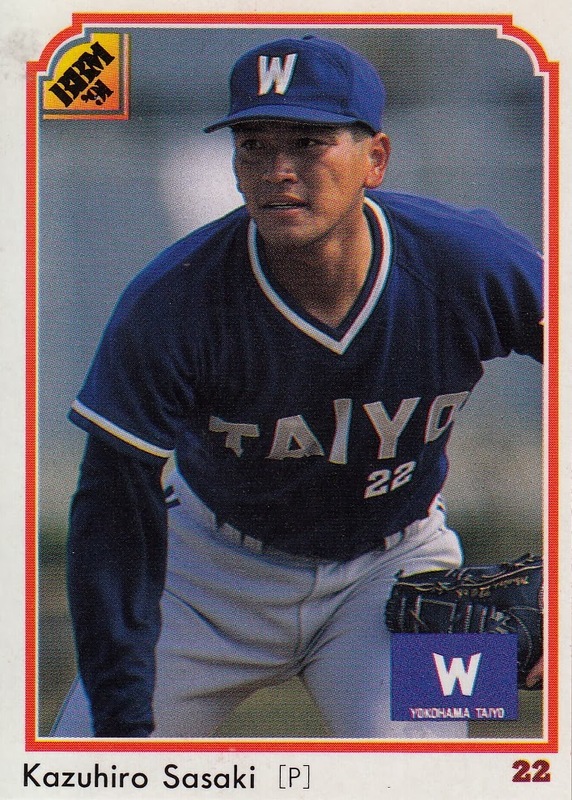 To me at least, Nomo was a major surprise. He's only the third player to ever be elected in his first ballot (following Victor Starffin and Sadaharu Oh) and he's the youngest player ever elected (although he's only six months younger than Sasaki). Here's some cards of the new inductees. I've done posts in the past for both Nomo and Akiyama but never Sasaki. Maybe I'll take care of that sometime soon. UPDATE: I neglected to mention something kind of important - Nomo and Sasaki are the first members of the Japanese Hall Of Fame to have spent time playing in MLB. 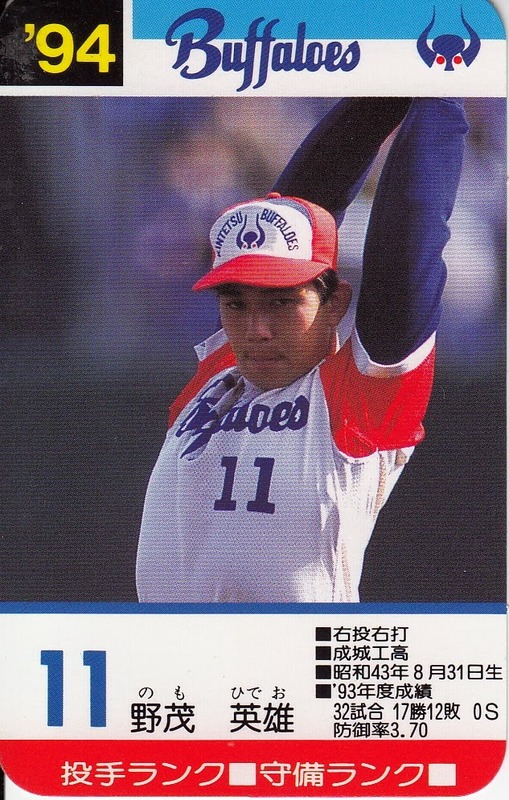 In fact, Nomo spent much more time playing in MLB than he did in NPB - he appeared in 12 different major league seasons but only five in Japan. I wanted to do one more quick post on the now-discontinued annual All Star box set from BBM. I had done some trivia in my post on the Nippon Series sets about who had appeared the most times in the sets. I thought I would do the same for the All Star sets. 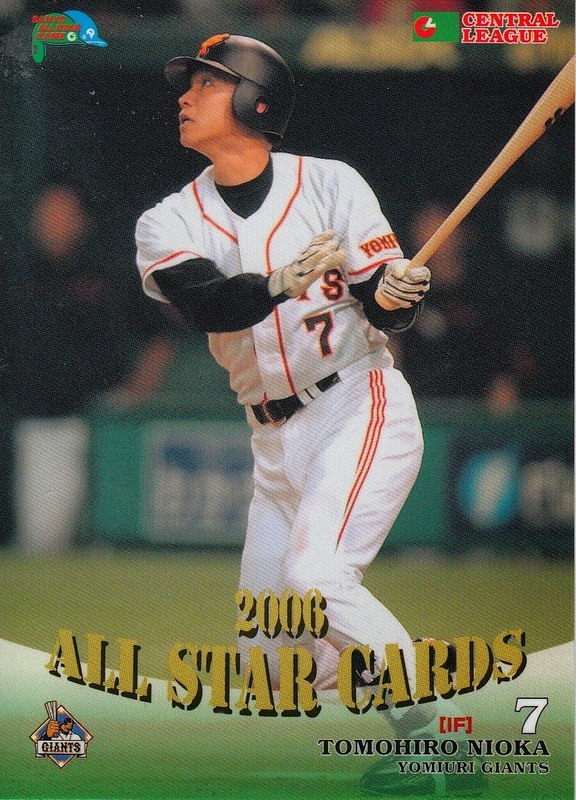 The two guys that appeared in the most BBM All Star sets as either a player or a manager/coach were Koji Akiyama and Atsuya Furuta, who were both in 17 of the 22 sets. 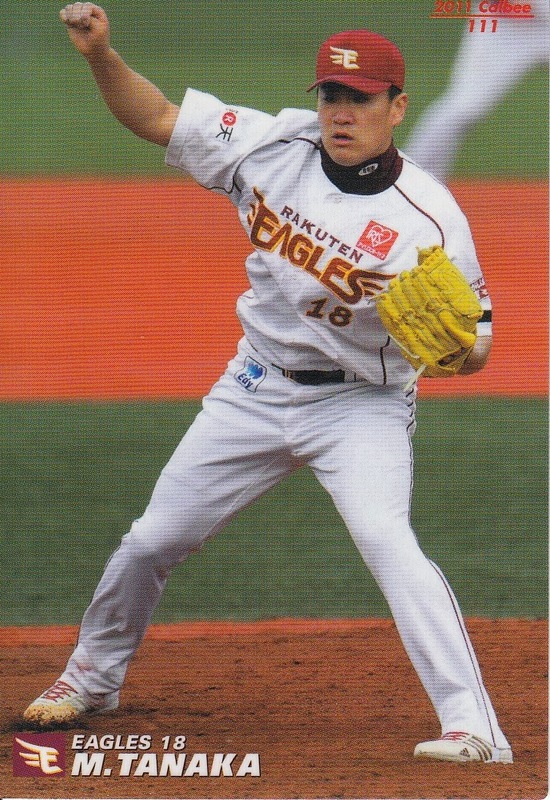 Furuta was also the player who appeared the most often - sixteen times. The manager who appeared in the most sets (as either the All Star manager or coach) was Akira Ohgi who was in nine sets. 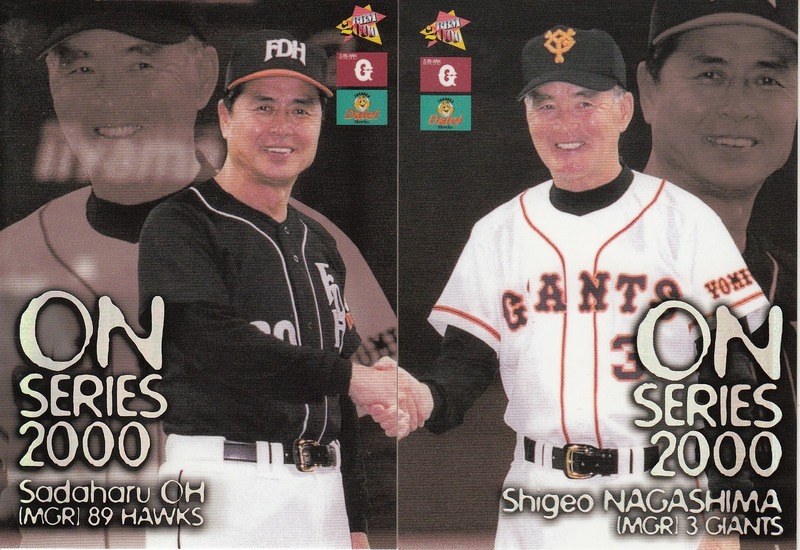 Tied for second were Shigeo Nagashima and Hiromitsu Ochiai, who each managed or coached the Central League All Stars eight times, every year they managed the Giants (1994-2001) and Dragons (2004-2011) respectively. Not only did BBM phase out their annual All Star box set last year but they also ended production of their annual Nippon Series set. This box set usually was released in mid-December to commemorate the Series concluded the previous month and was the final set of the product year. BBM had produced this set every year since 1991 up to and including 2012. Each set would (at a minimum) contain the cards for every player for each team that appeared in the Series (which is not the same as every player on each team's roster) as well as the manager for each team. 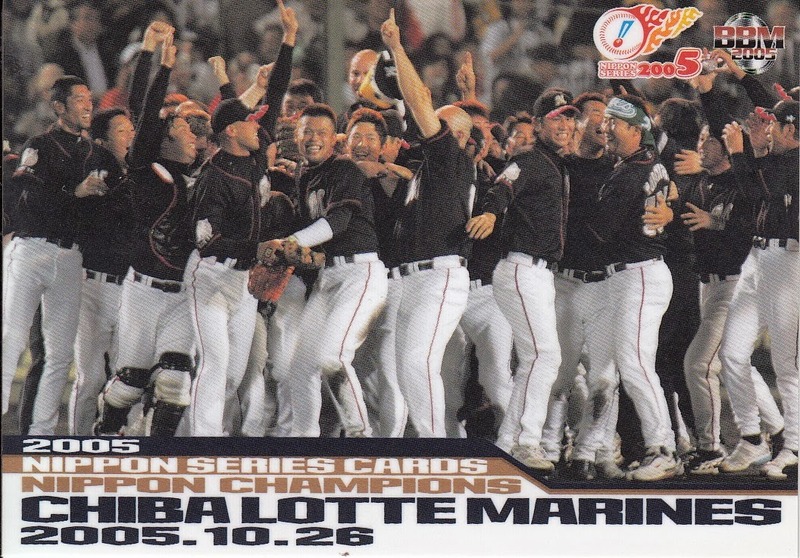 In addition, each set also contained a card commemorating the winning team (from 1991-2000 this would be a formal team picture, from 2001-2012 it showed the team celebrating - frequently tossing their manager in the air in the traditional do-age). Each set also contained five cards for the winners of the major Series awards - MVP, "Fighting Spirit" (sort of an MVP of the losing team) and three "Outstanding Player" awards (which can be given to players from either team). In addition to the cards described above, a handful of the sets featured additional cards. 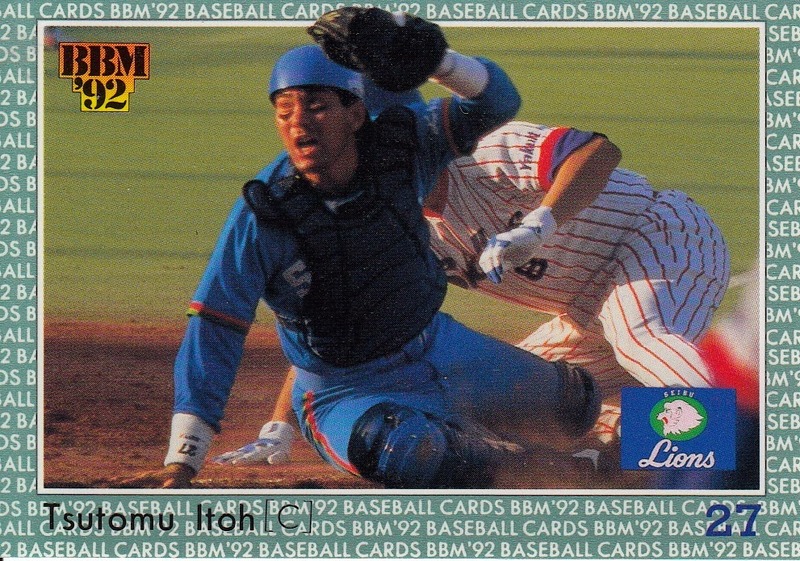 For the 1996 matchup between the Blue Wave and the Giants, BBM included a double sided "Rivals" card featuring Ichiro on one side and Hideki Matsui on the other. 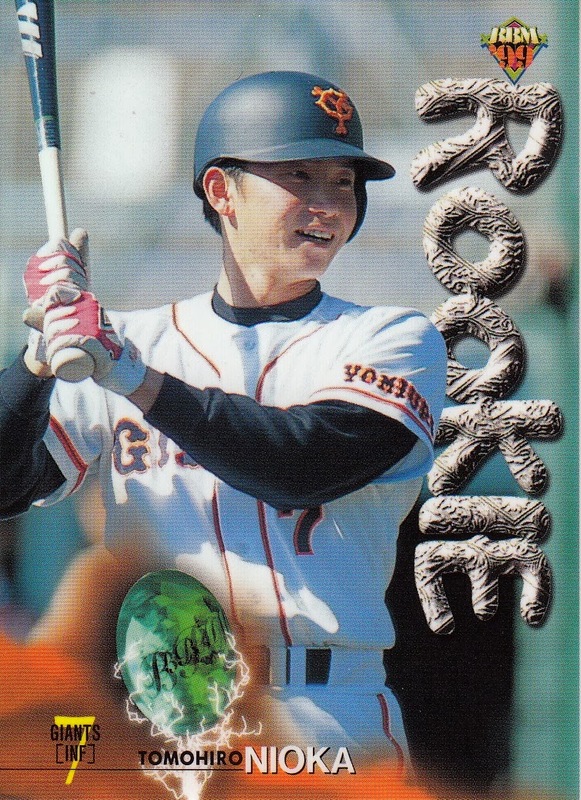 The following year they did a similar card with Kazuo Matsui on one side and Atsuya Furuta on the other - but this time it was an oversized card. 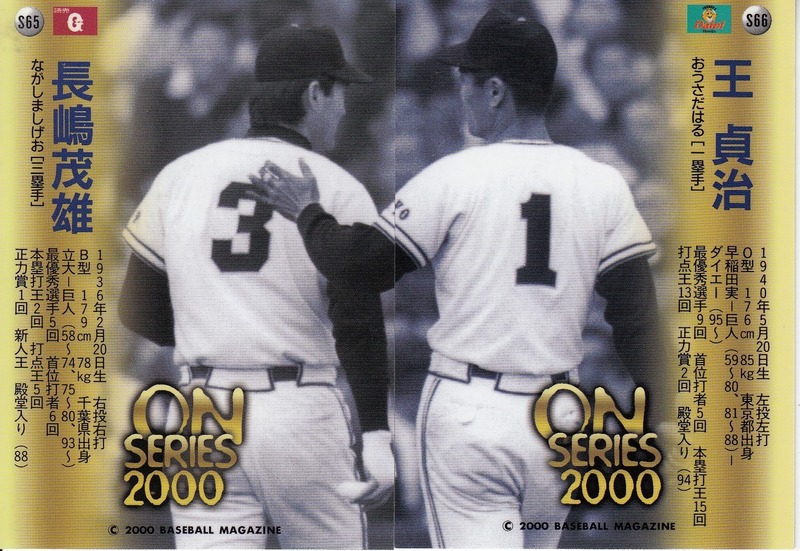 Each set in 1998 contained essentially an insert card of either Kazuo Matsui or Kazuhiro Sasaki. 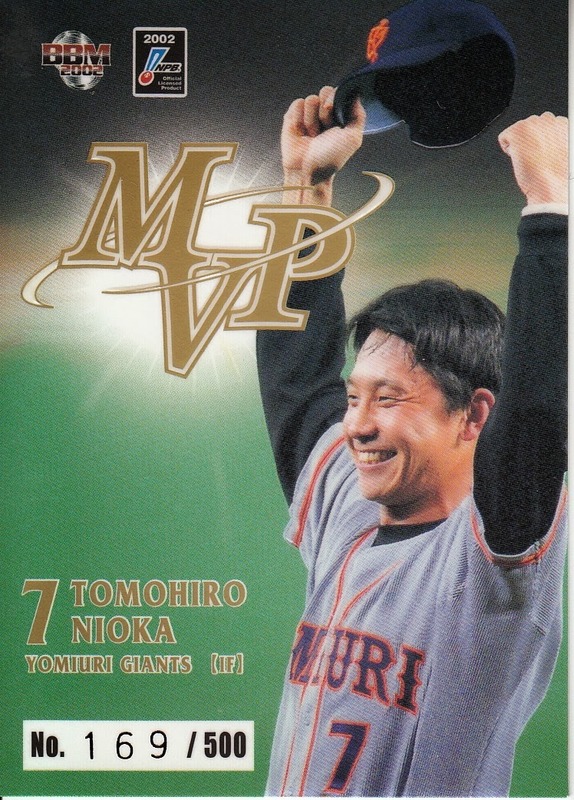 In 1999, there was some sort of "special" version of Koji Akiyama's MVP card - I don't know how that "special"-ness manifested itself or even if I have the normal or the "special" version. 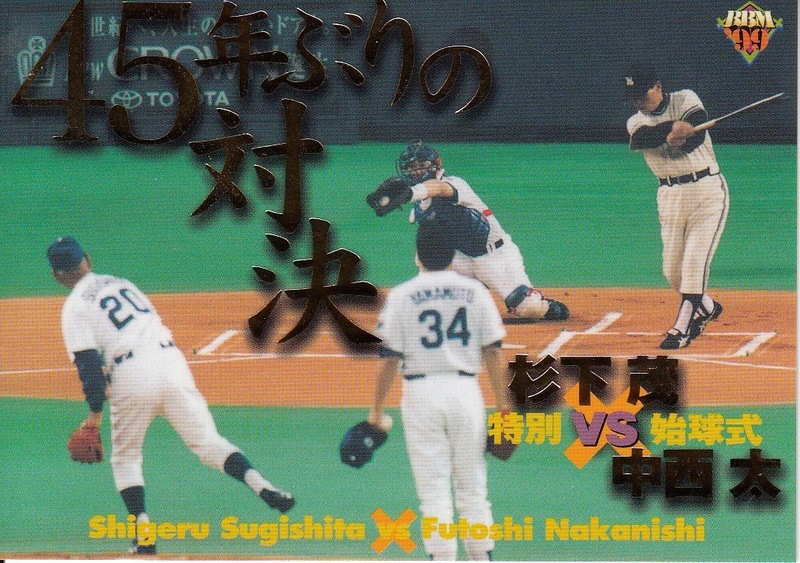 In addition, the 1999 set also contained a card featuring Shigeru Sugishita and Futoshi Nakanishi, who had faced off against each other in the 1954 Series. 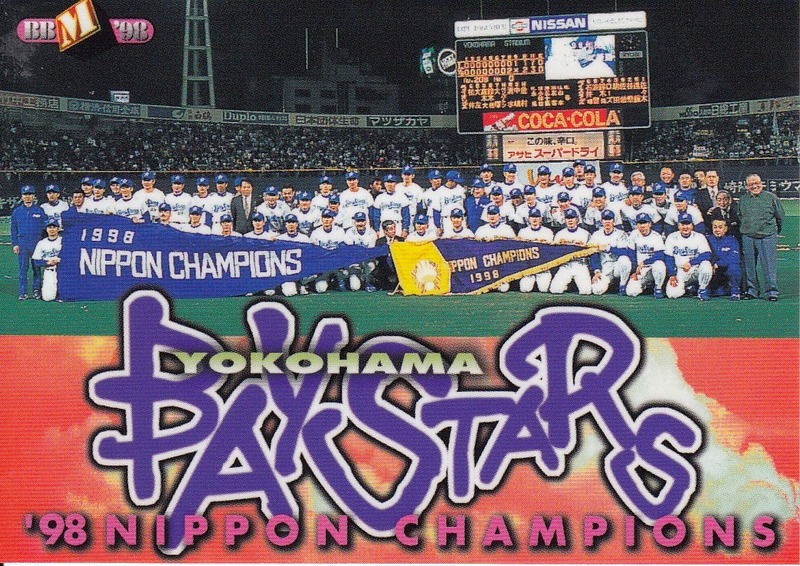 I don't know if this was some sort of commemoration of the 1999 Series being the 50th Nippon Series or because it was 45 years since the Dragons had last won a Series (although they had been in several since then). I mentioned that there were a couple exceptions - in the 1991 set, there's three players who played in the Series but for whatever reason BBM used a portrait (or mug shot) on their card rather than an action shot from the Series. 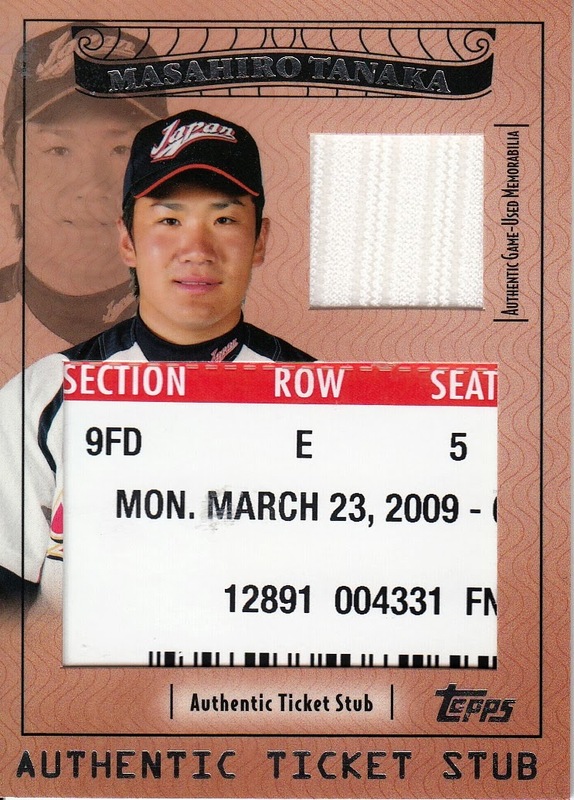 There's also one case of a player making the set who didn't actually play in the commemorated Series - Takeshi Yamasaki of the Dragons was hurt late in the 1999 season and was not able to play in the Series but he appears in the set anyway. 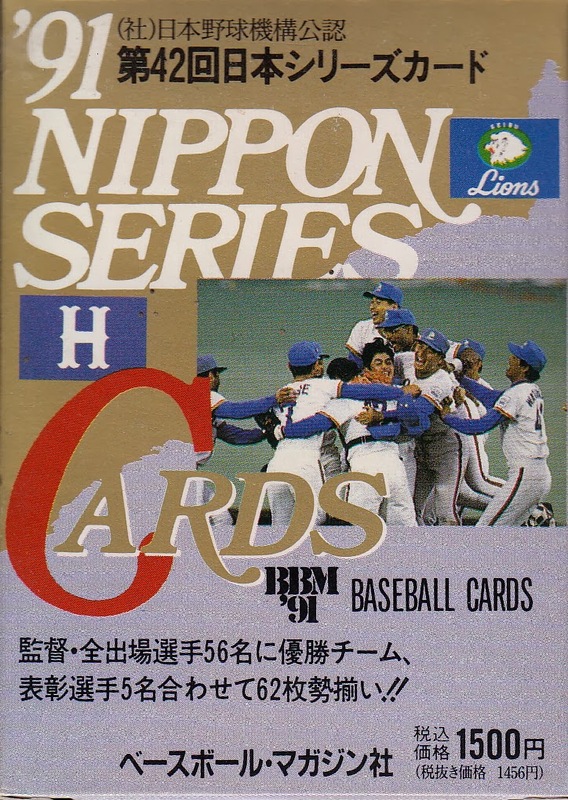 12 of the 13 NPB teams (counting Kintetsu and Orix as separate teams) made the Series between 1991 and 2012 and are therefore included in one of the sets. 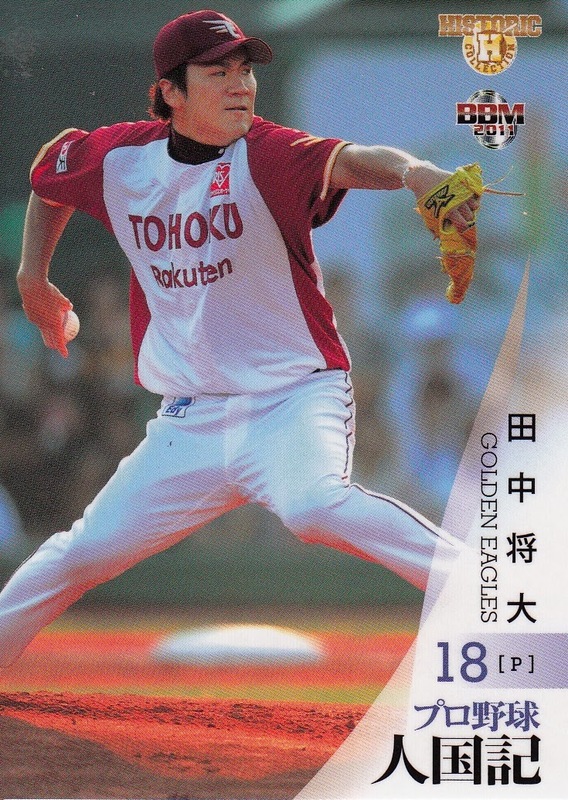 The only team that didn't, the Tohoku Rakuten Golden Eagles, of course made the Series for the first time in 2013, just missing out on being in one of the sets. With nine appearances, the Lions made the set the most times (1991-94, 1997-98, 2002, 2004 & 2008) with the Giants the second most frequent team with seven (1994, 1996, 2000, 2002, 2008-09, 2012). There were six Series with the Dragons, five for the Swallows, four for both the Hawks and Fighters, two for the Blue Wave, Marines and Tigers and one each for the Baystars, Buffaloes (Kintetsu) and Carp. Not surprisingly, the two most common match-ups both featured the Lions - there were three Lions/Giants Series (1994, 2002, 2008) and three Lions/Swallows Series (1992-93, 1997). 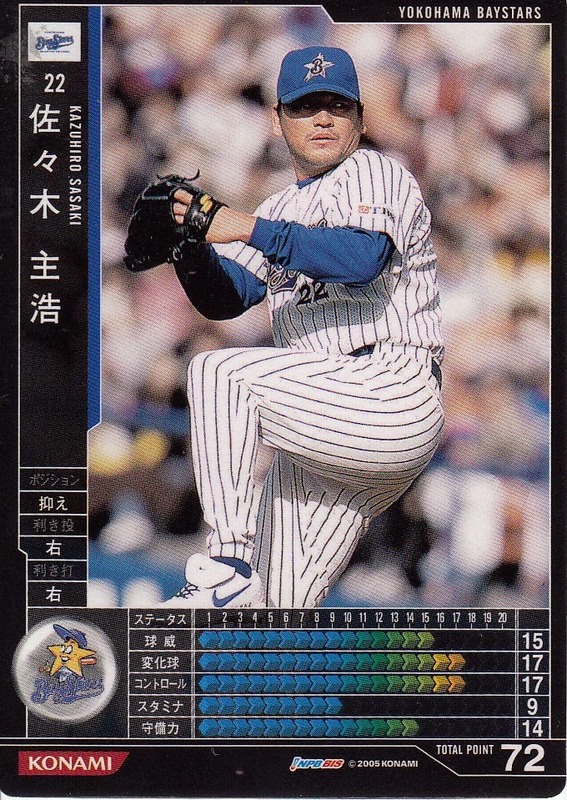 The person who appeared as a player or manager in the most sets was Tsutomu Itoh, who appeared in seven sets as a player and one as a manager (he was with the Lions in every appearance except 2008). There were seven players who appeared in seven sets as a player only - Masafumi Hirai, Atsunori Inaba, Itoh, Kimiyasu Kudoh, Satoshi Nakajima, Tatsuya Shiozaki, Ken Suzuki. The manager who appeared in the most sets was Hiromitsu Ochiai (five). 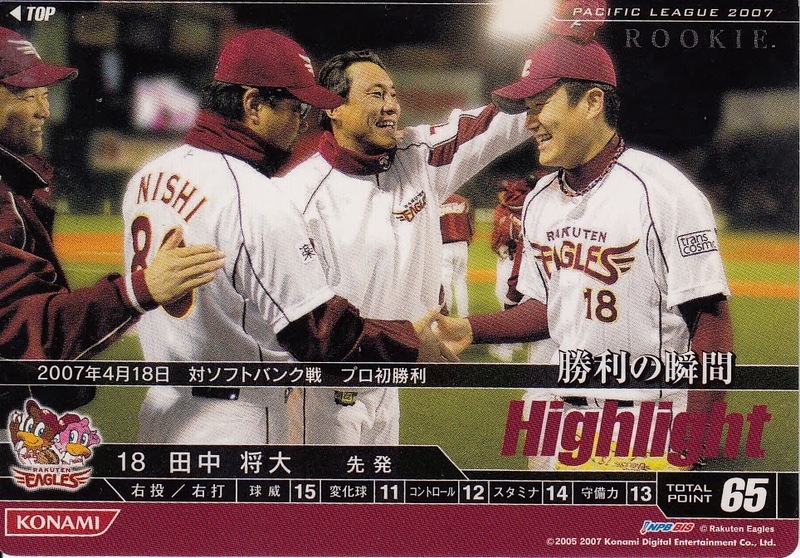 There were three players who won an award in three separate Series - Koji Akiyama (two MVPs and an Outstanding Player), Atsunori Inaba (one of each award), Kenji Johjima (a Fighting Spirit and two Outstanding Player awards), Kazuhito Kiyohara (two Fighting Spirit and an Outstanding Player award) and Kazuhiro Wada (aFighting Spirit and two Outstanding Player awards). 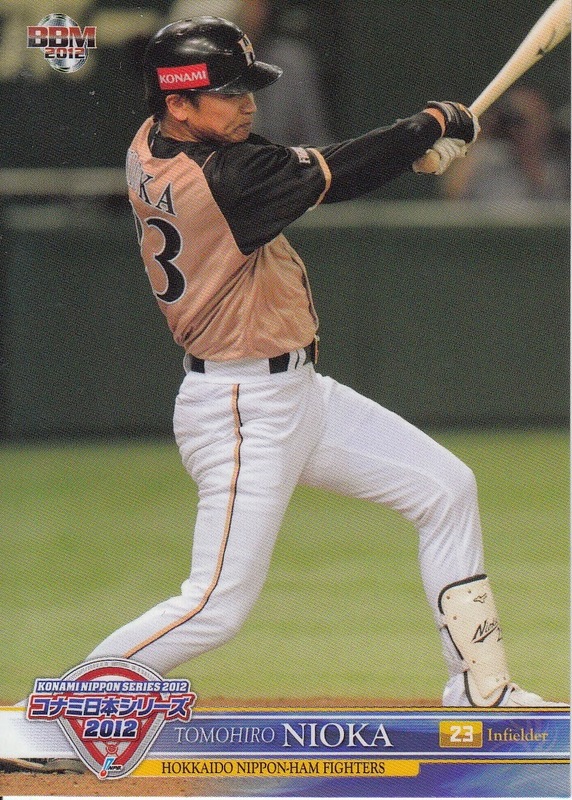 There were three guys to win two MVPs (Koji Akiyama, Atsuya Furuta and Toshiaki Imae), two guys who won two Fighting Spirit awards (Kenshin Kawakami and Kazuhiro Kiyohara) and seven guys who won two Outstanding Player awards (Tetsuya Iida, Takahiro Ikeyama, Kazuhisa Ishii, Kenji Johjima, Kimiyasu Kudoh, Shingo Takatsu, and Kazuhiro Wada). No one else won more than one of any of these awards. 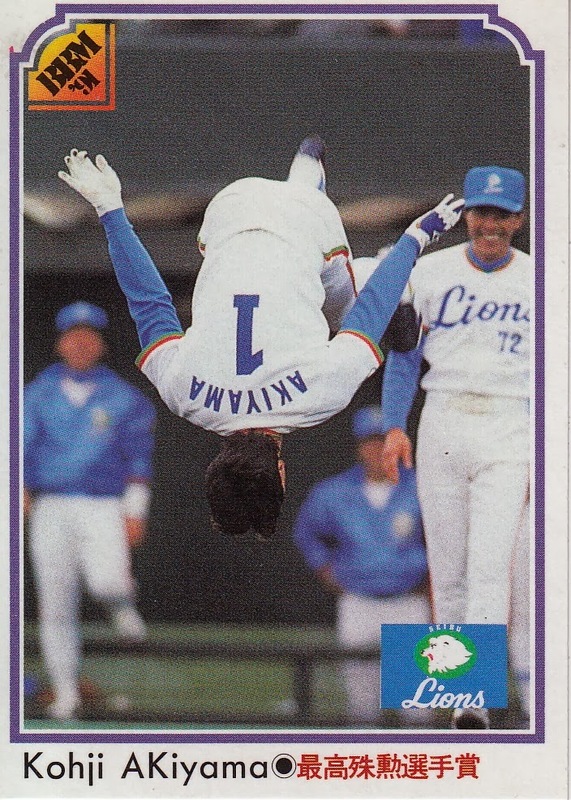 In Ryan's Blog Bat Around post the other day, he mentioned that there was a Japanese Hall Of Famer named Shigeru Makino who apparently has not appeared on a card since 1981. I got really curious about why that was - BBM has done a remarkable number of OB sets in the past 15 years and it seemed difficult to believe that a Hall Of Famer would have been left out. The first thing that strikes you when you look at Shigeru Makino's playing record is how mediocre it is. He hit .217/.286/.272 with 9 home runs in nine seasons with the Dragons from 1952 to 1959. He never managed a team. There's a handful of guys who made it to the Hall Of Fame based on their collegiate careers but usually that's for pre-professional era players. 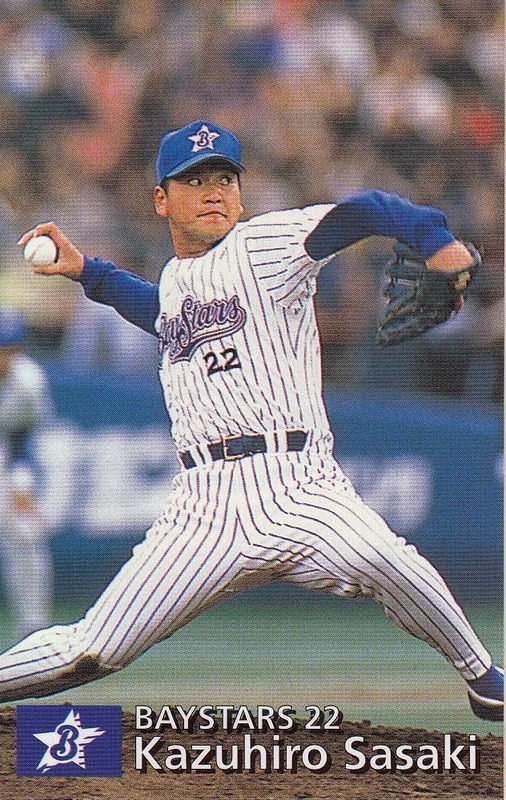 Why did Makino make the Hall Of Fame? 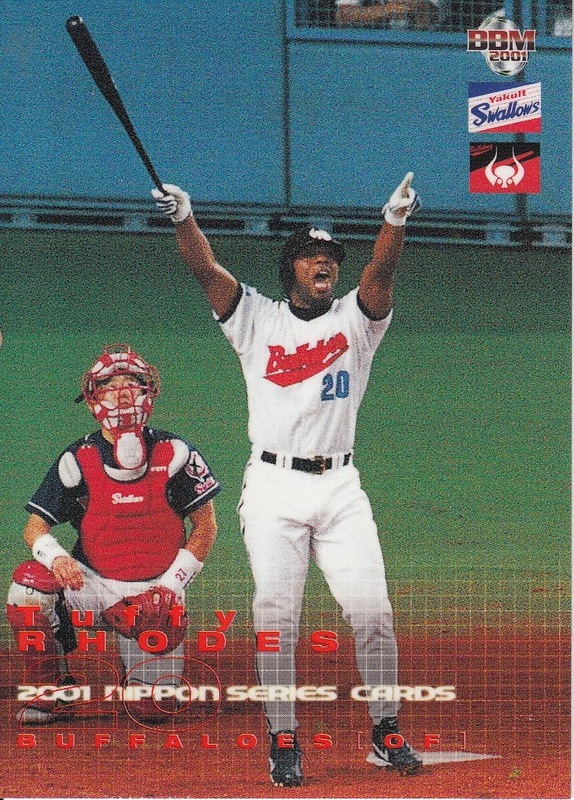 I took a look at "Japan Baseball Superstars", the book Gary Engel and Rob Fitts published in 2001 that contains write-ups on all Hall Of Fame and Meikyukai members up to 2000 and I got my answer. 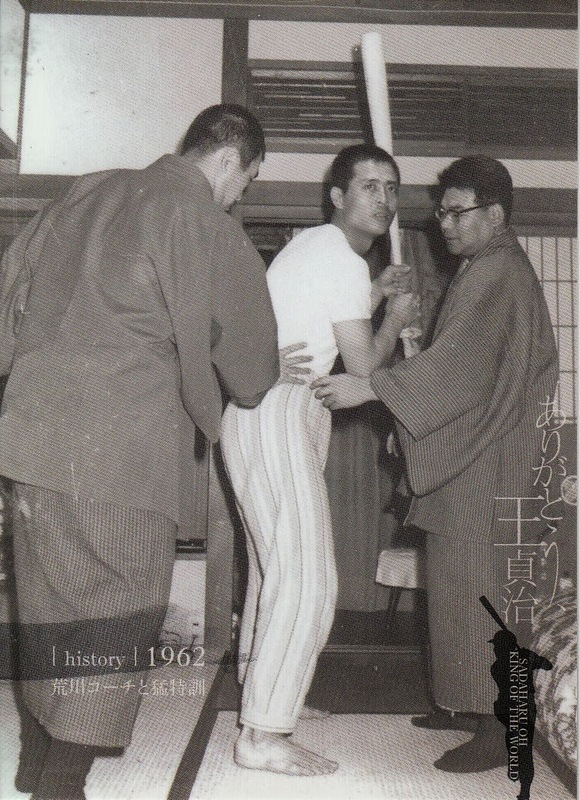 After retiring as a player in 1959, Makino became a coach with the Dragons for the 1960 season. 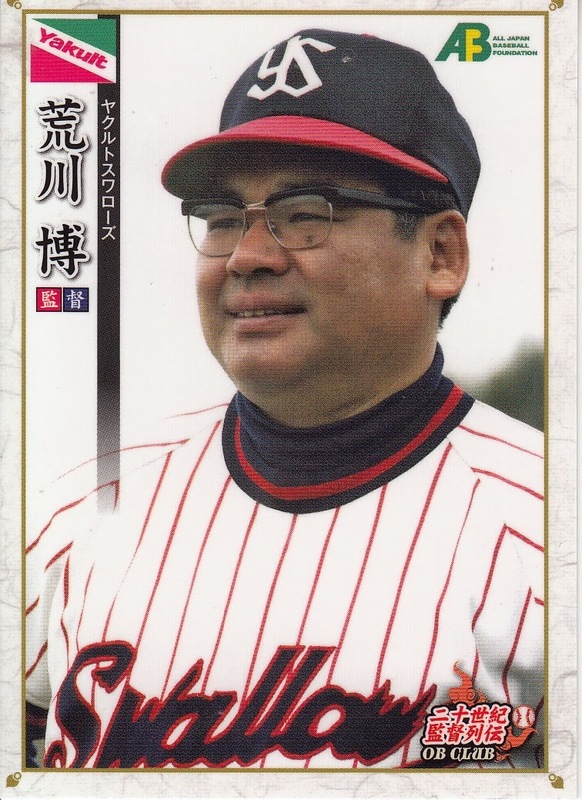 When Tetsuharu Kawakami took over the Giants in 1961, Makino switched teams and became Kawakami's head coach. The two of them developed a managerial style called "Controlled Baseball" which controlled all aspects of the ball player's behavior, both on and off the field. This style resulted in 11 Nippon Series championships over the 14 years that the two of them ran the team, including nine consecutive championships from 1965-73 (the "V9" years). His coaching career is what put him in the Hall Of Fame (which is reflected in his write up at the Hall's web site). 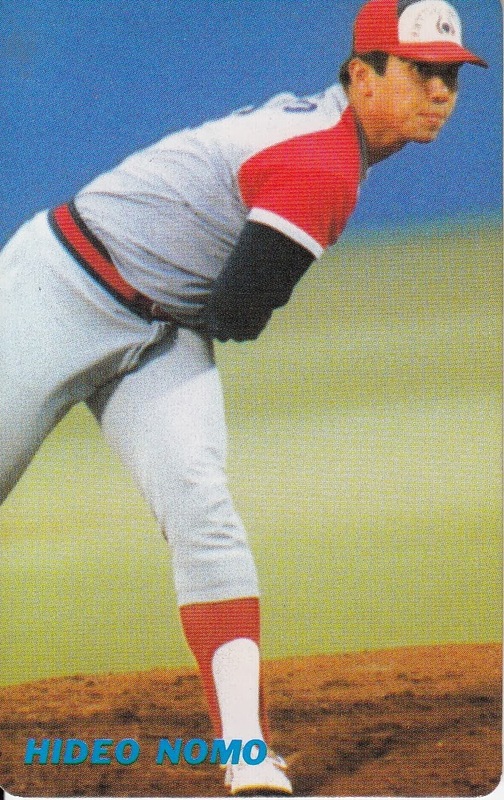 Makino left the Giants when Kawakami stepped down as manager following the 1974 season. 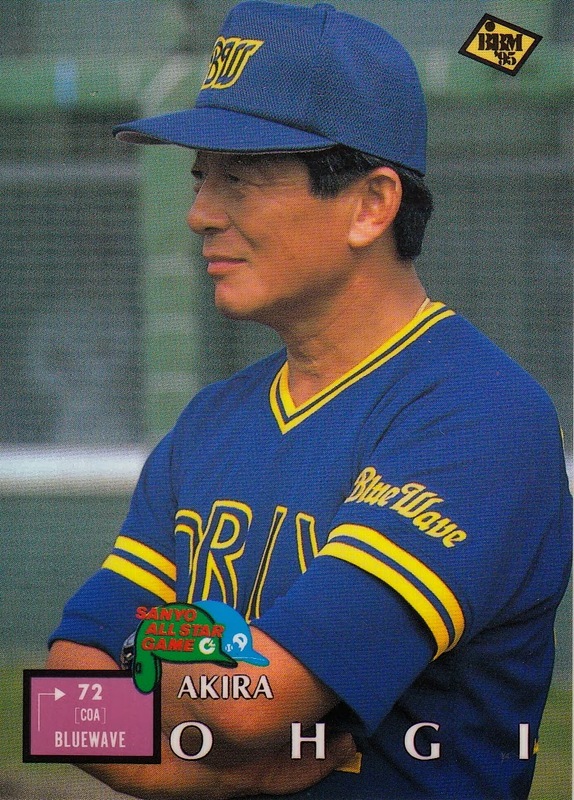 He returned to coach the Giants under Motoshi Fujita from 1981 to 1983. He passed away in 1984 and was elected to the Hall in 1991. 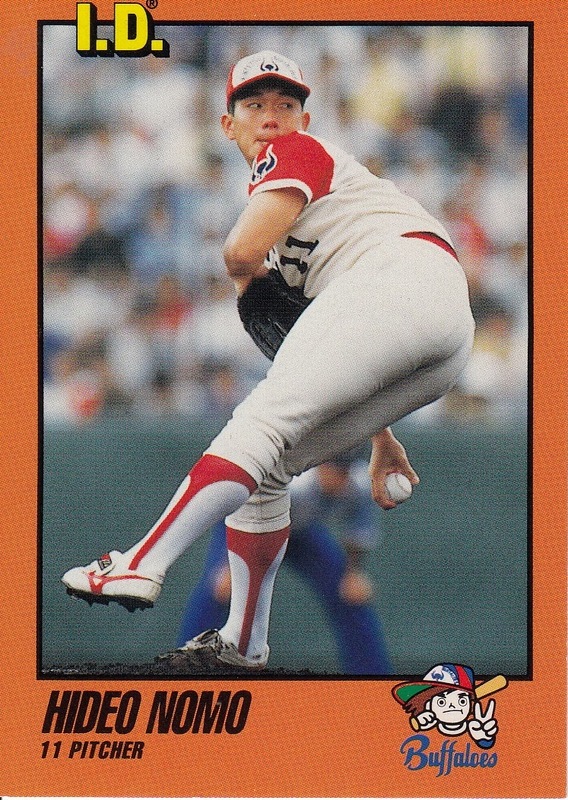 As Ryan mentioned, Makino's most recent card is from the 1983 NST set. He does not appear in any of BBM's sets, not even the Giants 70th Anniversary or the Dragons' 70th and 75th Anniversary sets. I'm not entirely sure how many cards exist for him total. 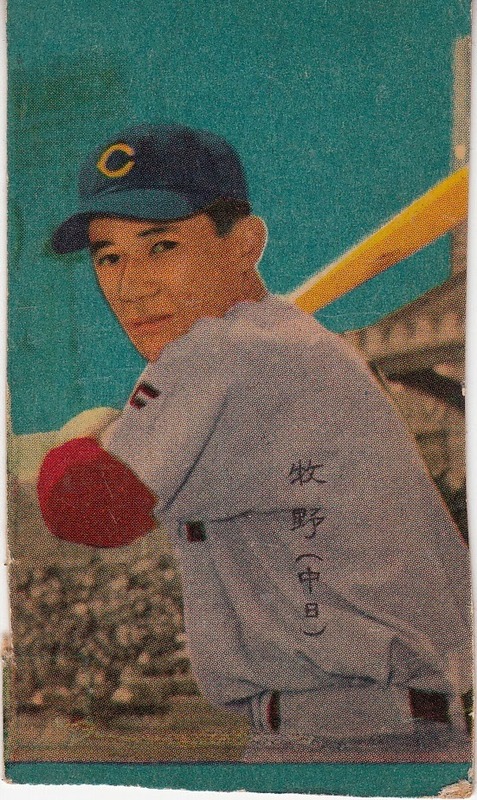 Glancing through the vintage edition of Gary Engel's "Japanese Baseball Card Checklist and Price Guide", I only found five other cards of him - three bromides (2 from the 1956 JBR29 set and 1 from the 1957 JBR19 set), one menko (1957 Marukami JCM28a) and one game card (1967 JGA 137). The game card is interesting as it shows him as a coach for the Giants. That set is extremely rare - Engel says that there's only one complete set that's ever been seen. 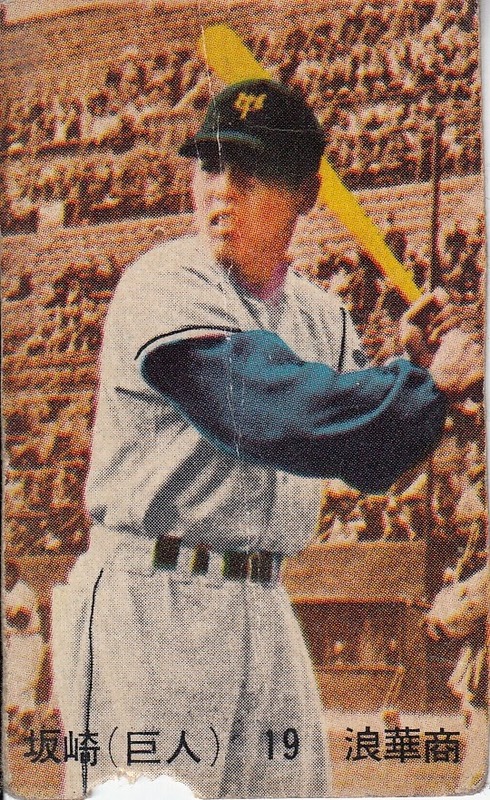 There may be other Makino cards out there - I may have missed something that was listed in Engel and there's still a lot of uncatalogued cards from the 1950's. But there doesn't appear to be a whole lot of cards of him. “Lost Cards.” Every year card companies come out with different sets and make decisions about what athletes they do and don’t include in those sets. They choose to include new subsets – and exclude old ones. What’s the card or card(s) that weren’t produced that you wish had been made? 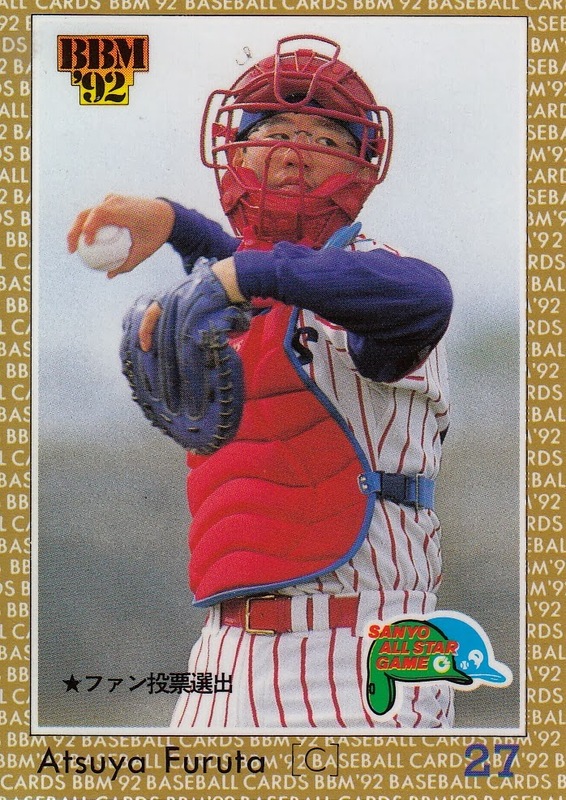 Ryan's post centered on the lack of "modern" (post 1990) cards of a number of players (around 25) who were significant in Japanese baseball history for some reason (threw perfect games, won major awards, hit for the cycle, elected to the Hall Of Fame, etc). His post is well worth reading (as always) so if you haven't checked it out, go do so. I'll wait. 1. 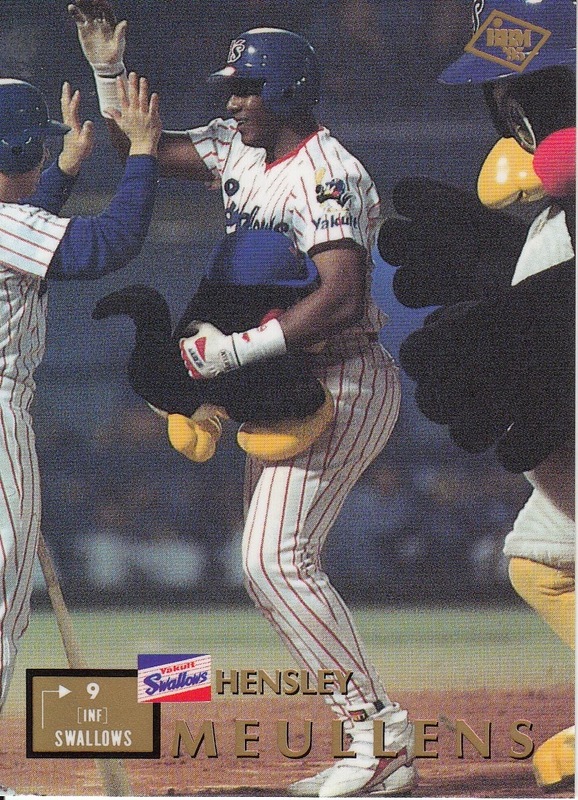 There's a handful of cards that BBM should have had in various sets over the 24 years that for whatever reason they didn't. It'd be nice in a couple cases when it was something commemorating a record if BBM issued a "lost card" for it. For example, I've pointed out a number of times that Bobby Rose didn't have cards in the 2001 set commemorating his leading the Central League in hits and being named as the Best 9 second baseman due to (I presume) a contract dispute with the Baystars that resulted in him not playing in 2001. As Rose has appeared in BBM card sets since then, it'd be great if BBM issued the two missing cards now. 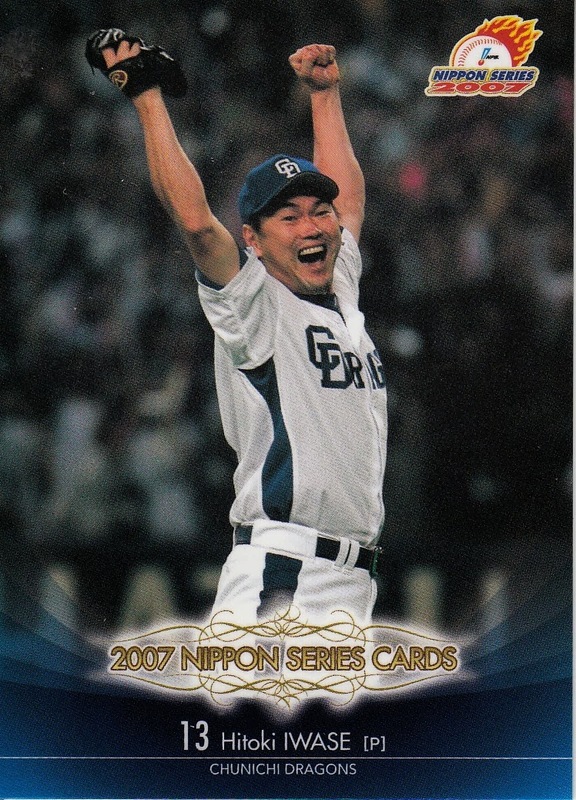 Similarly, it'd be cool if BBM could issue cards for the five no-hitters not included in the 2012 No-Hitters set (as well as the one Daisuke Yamai threw last year) as well as re-issuing the 12 cards in the 2000 20th Century Best 9 set that don't have pictures on the front (the four cards each for Hideo Nomo, Warren Cromartie and Masaichi Kaneda) with pictures. 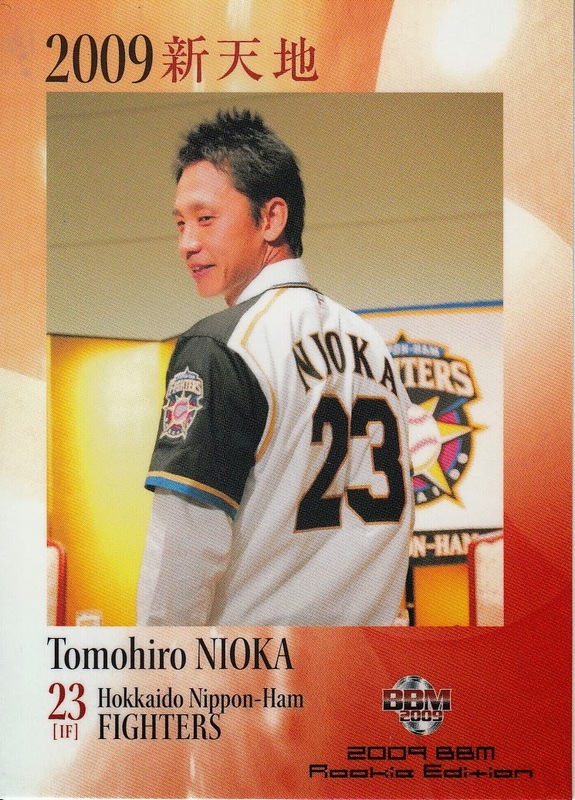 There's also a handful of players who appeared in NPB in a season that BBM did cards but didn't make the set. Off the top of my head, there was Matt Stairs in 1994 and Omar Linares in 2002-2003. BBM could issue cards for these guys in the style of the seasons they played here. 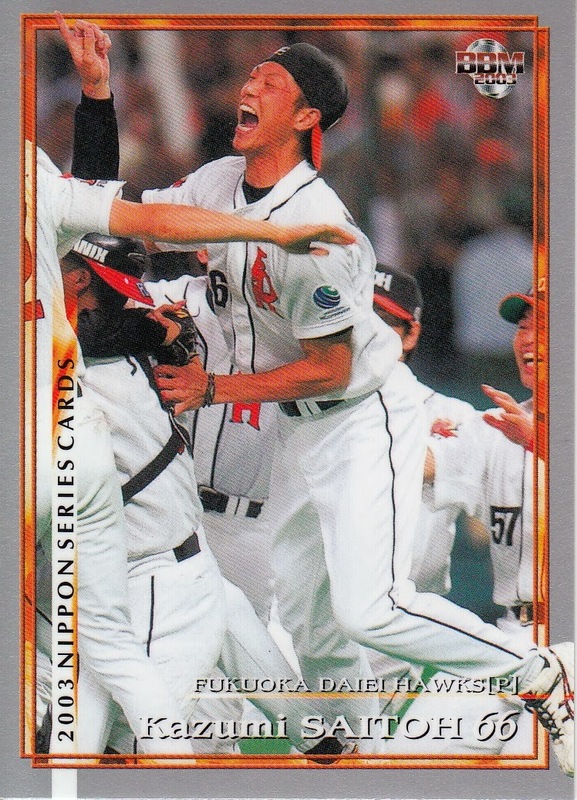 And ditto for Calbee - there's any number of Title Holder and Best 9 cards missing from the last 14 years (which I exhaustively covered here) that they could come out with now, as well as any number of significant players left out of various sets. 2. I'll get into this more in the post I'm planning in a few months on the team based OB sets that BBM's done over the last decade but there are a number of teams that have incomplete histories in BBM OB card sets. 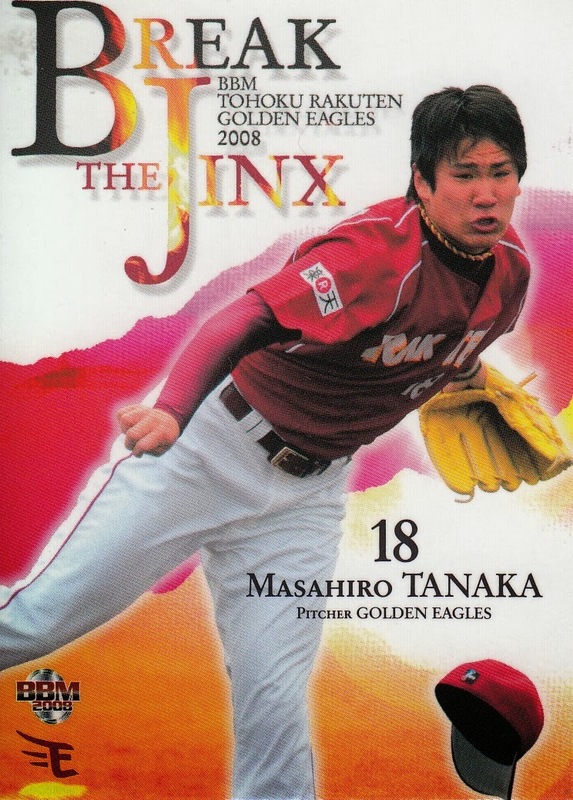 Only the Giants, Tigers, Dragons, Hawks, Lions, Carp and Eagles (as well as the Kintetsu Buffaloes) have had sets done that cover their entire sets. The other five teams have either only had a subset of their history covered in their OB sets or their history has only been covered in a couple small box sets. 3. BBM's OB sets tend to concentrate on the stars from the 1970's and later. It'd be great to have a "Stars Of The 1950's" and "Stars Of The 1960's" sets (as well as even earlier). 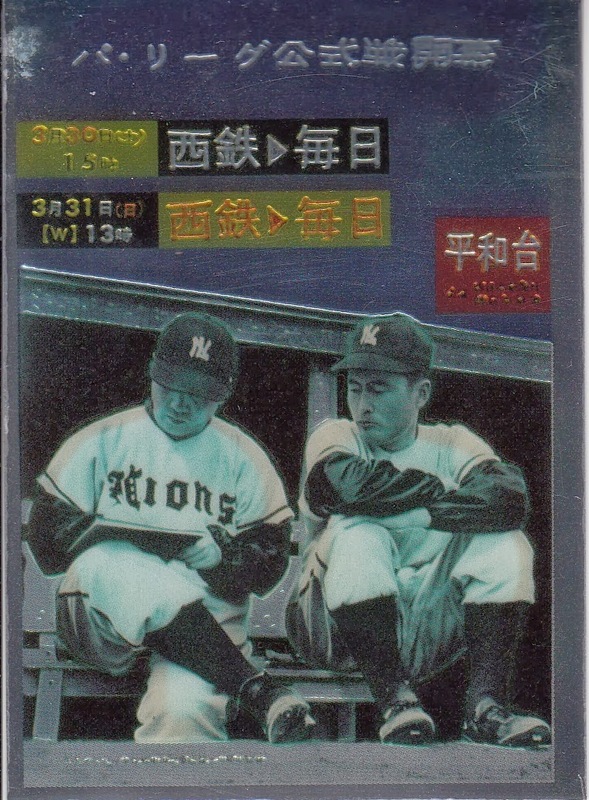 BBM did do a "Nostalgic Baseball" set in 2006 that covered the 1930's-1960's but it was not nearly in depth enough. 4. With this being the 80th Anniversary of professional baseball in Japan, I'd like to see a good 80th Anniversary set that commemorated some of the highlights in baseball history - Kazuhisa Inao's four wins in the 1958 Nippon Series, the Emperor's Game, Daisuke Yamai & Hitoki Iwase's combined perfect game in the 2007 Series, Atsuya Furuta hitting for the cycle in an All Star game etc, along with the obvious ones - Oh passing Aaron, Kinugasa passing Gehrig, Kaneda winning his 400th. I at least would like to see something better than what they did for the 70th Anniversary. 5. This is also the 80th Anniversary of the 1934 US Tour Of Japan (and it's not a coincidence that they Anniversaries are in the same year). I'd love to see someone do a commemorative card set featuring the players from both teams. 6. 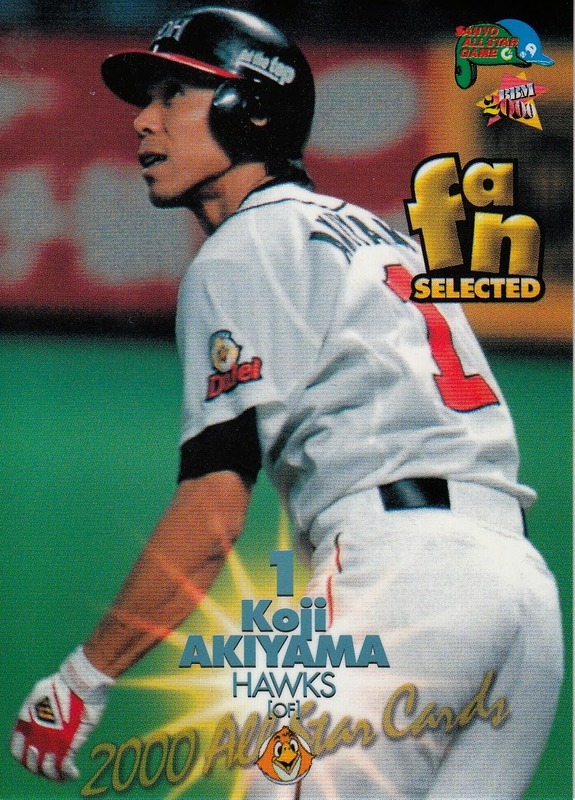 I'll echo one of Ryan's wishes - I want someone to do a Japanese Hall Of Fame set. There's a number of players in the Hall Of Fame who either have not had cards ever or have not had any recently. Unlike Cooperstown, the Japanese Hall Of Fame doesn't even sell postcards of the plaques.